Which versions of Oracle does IDrive support? Are there any special settings that I should be aware of while performing backup/restore using the IDrive application? How do I backup Oracle databases? Does IDrive support backup of Oracle server which is running on Linux/Unix Operating system? Does IDrive perform incremental backup of Oracle databases? Can I backup Oracle server databases located at a remote location, using the IDrive application? How do I convert the database to the ARCHIVELOG Mode? Can I backup the databases from multiple instances of the Oracle server with IDrive? Can I select the Oracle server backup location on the network? 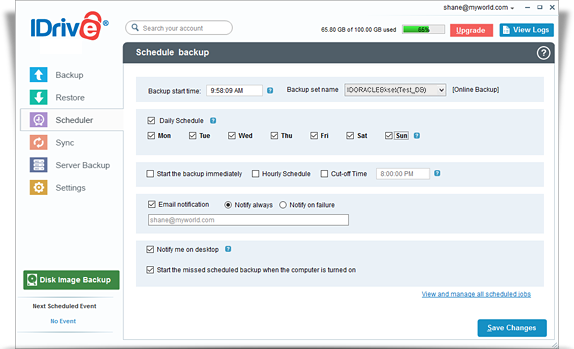 Where and how should I select the remote server backup location? I am receiving an error message for insufficient privileges while performing the Oracle server Backup. Why? Can I perform Oracle server backup in the 'Mirror Path' mode? Can I add/modify the files present in the Oracle backup folder 'IDORACLEBackup'? Can I remove the Oracle backup folder 'IDORACLEBackup' from my local computer on completion of Oracle server backup to my IDrive account? How do I restore my Oracle database back to Oracle server? Where should I place Oracle backup folder 'IDORACLEBackup' to perform Network/Remote Oracle server database restore? How do I restore the Oracle database to a different server? The Oracle database selected for backup must be in the ARCHIVELOG Mode. For remote backup, select the temporary directory on the computer where the Oracle server service is running. Ensure that the temporary directory selected on the computer for the local backup of the Oracle server is mapped from a remote location and has sufficient space to hold the Oracle server backup resources. You must have the SYSDBA privileges. Ensure that the selected temporary directory on the local computer has sufficient disk space to hold the Oracle server backup resources. Yes. IDrive supports backup of Oracle server running on Linux/Unix operating systems. Install the Oracle client on one of the computers with Windows operating system and configure the Oracle Client and Server, in addition to the Oracle server which is running on your Linux/Unix machine. Download and install the IDrive application on the Windows computer where the Oracle client application is running. Share a folder on your Linux/Unix system and map the same as a drive on your Windows machine. During Oracle server backup, select this mapped drive as the temporary directory to hold the Oracle server backup resources. Ensure that the temporary directory selected for the local backup of Oracle server is mapped from the Linux/Unix computer and has sufficient space/privileges. Schedule the Oracle server backup for the desired frequency. Yes. IDrive performs incremental backups of Oracle databases. Yes. You can backup the Oracle server databases present at a remote location. For this, select a temporary directory on the computer where the Oracle server service is running. Ensure that the temporary directory selected on the computer for the local backup of Oracle server is mapped from a remote location and has space to hold the Oracle server backup resources. 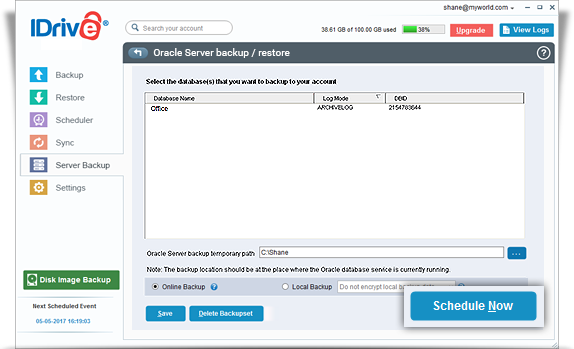 To perform the Oracle server database backup, set the database to the ARCHIVELOG Mode. Yes. 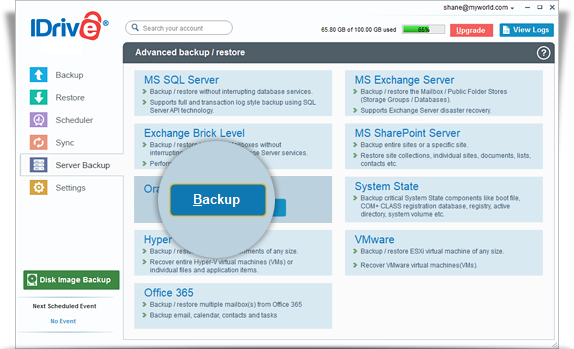 IDrive can backup databases from multiple instances of the Oracle server. The IDrive application allows you to select the backup location on the network for the remote backup of Oracle server databases. Choose the temporary location on the computer where the Oracle server service is running. Ensure that the temporary directory selected on the computer for the local backup of Oracle server is mapped from the remote computer and has sufficient space to hold the Oracle server backup resources. Select the temporary location on the remote computer where the Oracle Server service is running. Ensure that the temporary directory selected on the computer for the local backup of Oracle server is mapped from the remote computer and has sufficient space to hold the Oracle server backup resources. This error occurs if you have logged into the Oracle server that does not have sufficient privileges to perform backup and restore operations. No. Even if you choose the 'Mirror Path' for backups, they take place in the 'Relative Path' mode. No. It is not advisable to add/modify files present in the Oracle backup folder 'IDORACLEBackup'. Any modification to files present in this folder impacts your Oracle server restore operations. Yes. 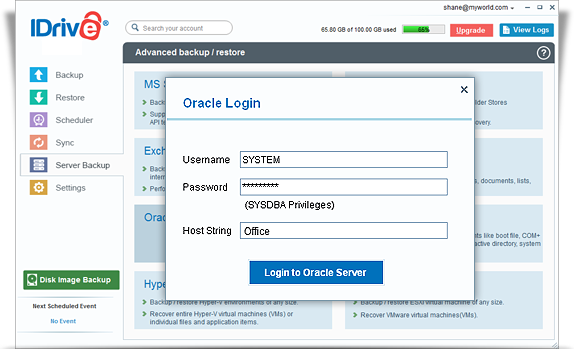 You can remove the Oracle backup folder 'IDORACLEBackup' from your local computer on successful completion of the Oracle server backup to your IDrive account. However, removing this folder prevents local incremental backup of your Oracle server databases. Locate and select the IDORACLEBackup' folder in your IDrive account. 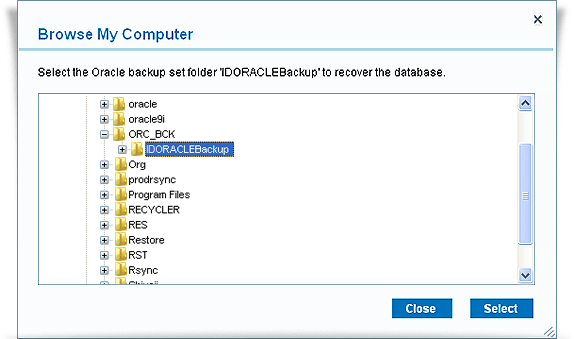 Click the 'Restore Now' button, to restore the IDORACLEBackup' folder to the local computer. 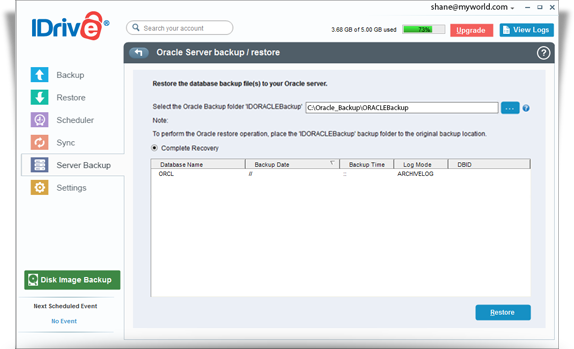 The 'Oracle Server backup/restore' screen is displayed. You need to select a temporary location on the computer where the Oracle server service is running. The 'IDORACLEBackup' folder selected for restore should be in the same path as it was while performing the backup operation. You need to use RMAN (Recovery manager) tool to restore the Oracle database to a different server manually. Details of DBID of backup database and original backup filename is found in file "IBOracleDB.ini", which is found in the IDrive backupset folder.